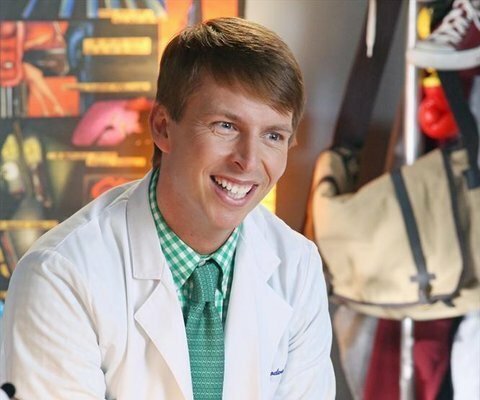 It’s been a few years since Bullz-Eye last chatted with Jack McBrayer…and by a few years, we mean more than half a decade: the previous occasion was when both the second season of “30 Rock” and “Forgetting Sarah Marshall” – both of which featured McBrayer, in case you’ve forgotten – were making their DVD debut. Since then, “30 Rock” has taken its final bow, leaving McBrayer without a full-time TV gig, but lord knows the man hasn’t been lounging around doing nothing. In addition to a very high-profile role in last year’s “Wreck-It Ralph,” either his voice or his actual physical being have turned up on Adult Swim’s “Childrens Hospital” and “NTSF:SD:SUV,” Comedy Central’s “Drunk History,” and, to bring this intro in for a landing, ABC’s “The Middle,” where, as part of his recurring role as the dentist for whom Frankie Heck works, he’ll be turning up for the annual Thanksgiving-themed episode, airing on Wednesday at 8 p.m.
Bullz-Eye: Well, I was able to watch the Thanksgiving episode of “The Middle” this morning, thanks to the kind folks at Warner Brothers, and I’m happy to say that it lives up to the high standards the series has set for its holiday episodes. BE: So how did you find your way onto “The Middle” in the first place, coming off of “30 Rock” as you were?